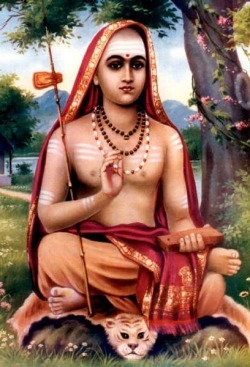 Shankara (Sankara) is probably the best known and influential philosopher of India. He became an ascetic very early in life and was influenced by Gaudapada who wrote a major piece on Vedanta. More than 300 written pieces of works are attributed to Shankara; his commentary on the Brahma-sutra is celebrated as his masterpiece and is now school text as an introduction to Vedanta. Vedanta is the philosophy that developed out of Vedic oral traditions and scriptures. It is translated as the 'conclusion' of the Vedas, which includes texts like the Upanishads, the Brahma-sutras and the Bhagavad-Gita. These writings are even older than the Bible and there are scholars who see the origin of all major religions in these 'revelations of Truth'. The Jnana Yogi Ramana Maharishi once said that the whole Vedanta is contained in the two Biblical statements: "I am that I AM" and "Be still and know that I am God." According to Vedanta philosophy, the human soul is part of All-awareness (Brahman). The human soul got involved with mental activity and is reborn until this circle is broken through remembrance of clear Awareness or Consciousness. It compares with a dream: We are reborn into the dream-state again and again unless we can find a way to stay awake. As all scripture and sages teach, waking up from our mortal dream is indeed possible. Shankara, in accordance with the philosophy of Vedanta, teaches that there is only one Reality, one God (Brahman). Everything else is subjected to change and is no more than an expression of Reality. When seen as Reality, the world is an illusion (a notion that is now becoming popular with quantum physicists). Since most folks prefer a simpler belief system, Shankara taught his philosophy mainly to Brahmins and intellectuals, who had no problems understanding Brahman as the omnipresent, eternal, Consciousness. They understood this Awareness as the essential Self within and everything else as a phenomenona mere appearance. His reasoning was resting on logic, the interpretation of the scriptures, but also on direct knowledge. The philosophy of non-dualism is called Advaita and Shankara's philosophy is sometimes called Atmadvaita. Self-Knowledge, known in India as the Atmabodha, is a short composition of 68 verses attributed to the great Indian philosopher SHANKARA . With this composition Shankara tries to serve all those who are ready to understand the Truth, which means they must be ready to break all ties and desire Liberation. Only direct Knowledge can be the cause for Liberation. Action by itself cannot destroy our illusions and delusions. It is because of our ignorance that we appear to be finite. When ignorance is destroyed by Knowledge, the Self reveals Itself by Itself, like the sun when the clouds are removed. Right practice leads to Knowledge. The world is like a dream: It appears to be real as long as we are ignorant of the Truth. When we are awake the world has disappeared like a dream. The world is like the illusion of silver in an oyster shell. All forms exist in the imagination of the perceiver. The world is to the all-pervading Awareness of God like the bracelet is to gold. As long as we admire the form, we do not see the gold. If we see the gold we do not admire the form. All characteristics are superimposed on the all-pervading Awareness. The gross body is formed out of five subtle elements. The subtle body is made of five pranas. The Awareness takes on characteristics in the same way as a crystal may take on the color of something that is red, blue, or green. Through discrimination, the seeker has to isolate the pure innermost Self from the mental coverings. The Self is only reflected in the clear mind. The Self, as pure Awareness, has to be seen as being distinct from body and mind. Like the moon appears to be moving when clouds are moving, so the Self appears to be active when mind and the senses are active. The nature of the Self, as pure Awareness, is Eternity, Purity, Reality, Consciousness, and Bliss. When the Self gets confused with body and mind it is overcome by mortal fears. The Self regains fearlessness by realizing the Truth about Itself. Awareness does not need another instrument, like the mind, to be aware of Itself. The Self is not this or that but Itself. The Self is without attributes and action. The Self is changeless, eternal, pure, and free. The Self is pure Awareness as God is pure Awareness. Pure Awareness is without a second. He who has attained the Supreme Goal dwells as the embodiment of Infinite Consciousness and Bliss. The practice that destroys ignorance is constant meditation. Because of ignorance the ever-present Awareness is not recognized. The seeker who has realized the Self sees the entire universe as the Self. Shankara sums up the essence of Vedanta in dasashlokii . He states that Only Atman Is while the world of names, form and various manifestations are just maya . He goes on to say that Atman is same as the supreme Brahman . Shankara also emphasises, as do upanishhads that the man who realizes aatma ALONE transcends worldly sorrow (tarati shokaMaatmavit). only to conform to the normal method of entering the Sannyasa Order, immediately accepted him as a disciple. May Shrii Shankara leads us from ignorance to Truth by helping us realize the aatman. AUM tat sat. na khaM nendriyaM vaa na teshhaaM samuuhaH . tadeko.avashishhTaH shivaH kevalo.aham.h .. 1..
tadeko.avashishhTaH shivaH kevalo.aham.h .. 2..
na vedaa na yaGYA na tiirtha bruvanti . tadeko.avashishhTaH shivaH kevalo.aham.h .. 3..
na jainaM na miimaaMsakaadermataM vaa . tadeko.avashishhTaH shivaH kevalo.aham.h .. 4..
na madhyaM na tirya.N na puurvaa.aparaa dik.h . tadeko.avashishhTaH shivaH kevalo.aham.h .. 5..
na kubjaM na piinaM na hrasvaM na diirgham.h . tadeko.avashishhTaH shivaH kevalo.aham.h .. 6..
na cha tvaM na chaahaM na chaayaM prapaJNchaH . tadeko.avashishhTaH shivaH kevalo.aham.h .. 7..
na vishvau na vaa taijasaH praaGYako vaa . tadeko.avashishhTaH shivaH kevalo.aham.h .. 8..
tadeko.avashishhTaH shivaH kevalo.aham.h .. 9..
na kevalatvaM na chaa.akevalatvam.h . kathaM sarvavedaantasiddhaM braviimi .. 10..
kiM naama te tvaM kuta aagato.asi . mat.h prItaye prIti vivardhano.asi .. 1..
na braahmaNa kshatriya vaishya shUdraH . bhikshurna chaahaM nijabodha rUpaH .. 2.
mukhatvaat.h pR^ithaktvena naivaastu vastu .